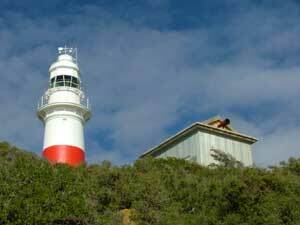 The Fog Alarm is sounded on most Sundays at mid-day by the volunteers who restored it.
. It's all over in less than 5 minutes so don't be late. 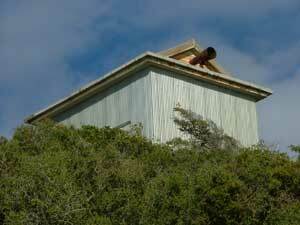 The Fog Horn installed at the Low Head Light station in 1929 is a Type "G" Diaphone. There are some who may be interested as to how this very penetrating sound is made. A great amount of the information herein was obtained from a recent book, "Lost Sounds", (isbn 1-870325-83-4) researched and written by Alan Renton and published by Whittles Publishing, Caithness, Scotland. It is reproduced with their kind permission. The book contains a comprehensive history of Fog Alarms and their use throughout the world for many centuries. The Diaphone was invented in the late 19th century by Robert Hope Jones. He was an English Engineering Draughtsman who also repaired church organs. The Diaphone was developed to enhance bass notes of large organs. He moved to North America and with the help of others, advanced his technology. It became noticed by marine authorities, on both sides of the Atlantic, looking for systems with a penetrating sound to be used for Fog Alarms. The installation at Low Head comprises 2 air compressors, only one operating at a time. The other as a standby. One compressor is powered by a 20 hp. Electric motor and the other by a 19 hp. Gardner kerosene engine. Each compressor supplies air to two large tandem air receivers to a regulated I pressure of 35 lbs per square inch. Large pipes are connected between the air receivers and two large air operated valves. One an operating valve, and the other the main sounding valve for the Diaphone. Smaller pipes are connected to relay valves which control the larger ones and an air motor which maintains the coding or timing of the sound blasts. The Diaphone consists of three main parts. A piston, a cylinder and an outer casing. There is also the resonator or trumpet but the function of this is to reinforce the sound and it's direction. The Diaphone piston has two diameters. The larger or driving end fits into a portion of the cylinder of corresponding size. Both the driving end of the piston and the cylinder are machined with various air ports. The smaller sized section of the piston fits into a corresponding section of the cylinder but each is machined with annular narrow slits. These slits are so arranged that during each stroke of the piston the slits come opposite each other allowing air to flow from the Diaphone casing to the interior of the piston and thus to free air through the resonator. When the piston is operated the slits are opened and closed 180 times per second .This means that the large volume of air flowing through is cut 180 times per second which produces the sudden intense note and enormous volume of sound. The outer casing contains an annular passage at the back of the Diaphone, round which the driving air passes. A passage at the front of the casing passes the sounding air . A characteristic of the Diaphone is at the end of each blast, as the piston passes from full speed to stop, it stalls and a peculiar "grunt" is produced. This adds enormously to the distinctiveness of the sound and under certain conditions greatly increases the distance at which it can be heard. The timing air motor drives two cam wheels through a gear box with a ratio of 243.2:1. The cam wheels open and close the small air relay valves which in turn control the piston operating valve and the main Diaphone sounding valve. The cam wheels are adjusted to provide the operating sequence of blasts unique to Low Head. The Operating Valve and the Sounding valve are ordinary bronze mushroom types but they are both actuated by pressure of air from the timing relay valves admitted to the undersurface of a pliable rubber diaphragm. The diaphragm is expanded and through a distance piece lifts the mushroom off it's seat and allows air to pass to the Diaphone. The cut-off valve between the compressor to be operated and the air receivers is opened. Either the electric motor or the Gardner engine is started. When operating pressure is reached the valve between the air receivers , the coding motor and the relay valves are opened. The Fog Horn operates. Sound the alarm!